【Why don't you?? ?】アンパンマン見習ったらどう？Why Don't You... Learn from Anpanman? Why Don't You... Learn from Anpanman? Ed. Note: Anpanman is a Japanese picture book series written by Takashi Yanase, running from 1973 until 2013 following his death. This is Anpanman, whose creator's recent death was on the news. Anyone in their 30s has grown up watching this cartoon on TV. I think it's pitiful; why is it that a world that has grown up watching Anpanman is still being controlled by Baikinman? 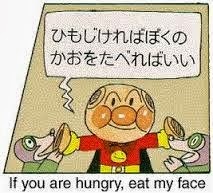 When I was a child I saw Anpanman share his own face with hungry children. "The world I was born into is lovely" I thought. But when I started to understand things a bit better, I realized clearly that the one who makes the laws for the world isn't Anpanman, but Baikinman "who owns everything and controls everything". In capitalism it makes total sense if you think about it: the workers get on with the plot that the capitalists write. The capitalists don't have the same ideals that Anpanman has; they treat workers like slaves and monopolize wealth. The violent, egotistical Baikinman era continues: the era of "money equals rights". We definitely grow with the times. We are wealthier than before (but the quality of life has deteriorated). We are at peace. The economy has raised people's standard of living and made us into a society that thrives on efficiency, with speed being the number one aspiration. But in terms of the economy, we are completely saturated; there's an overflow of things, including jobs that are unnecessary for our work world... and things that are unnecessary for our cities. Even if there was no need to produce anything more, people would not stop producing because they don't want to stop this life... even if it means the extermination this world. America's default is near too; the world economy seems like it's not going well and in the near future how are we going to grow? In the future and from now on? Throw away the Baikinman world, full of ego and greed and create the Anpanman world, which we were familiar with as kids... the world of love and courage. What makes you happy? What gives you joy? Life ends without you knowing. I don't want that. What was I born for and what do I live for now? I can't answer that and I hate it. 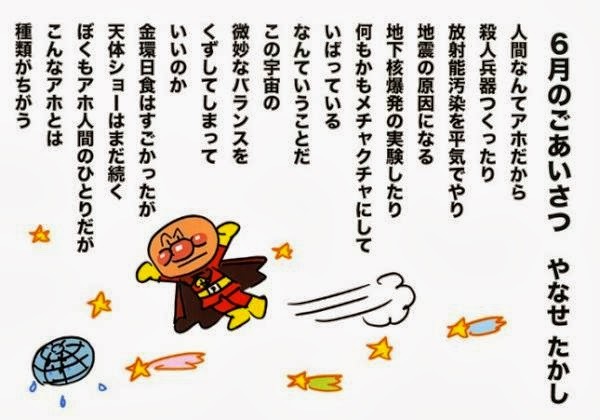 Even now, if you have time to admire the lyrics of the Anpanman song, take a closer look at yourself: are you the "happy happy mold spores" that Baikinman exploits? The "happy happy mold spores" surround Anpanman, the origin of love and courage. They grow on him and die. What makes you happy? What were you born for? What is your mission in life? You're not a street fighter tainted with evil and killing all the time; you're a minion of evil, you're a happy happy mold spore... are you OK with that? You were given the same hope as I was when you were born, right? Look at Ampanman. If you're ashamed at your vague present, not knowing why you were born, then live your life in the manner you were shown when you watched Anpanman. Can you tell your innocent child-self that "mommy and daddy are actually happy happy mold spores exploited by Baikinman"? If you have awakened, then contribute to a new future. Why don't you cast aside the concept of a life you don't understand and learn from Anpanman?